Captain Ernest D. Scott, Jr., Air Corps (USMA January 1943), was killed near Selfridge Field, Michigan, when on duty as co-pilot of a plane on an inspection trip from Washington, D.C. He was born 1 November 1920 at Fort Sam Houston, Texas. He is survived by a brother, Bruce von G. Scott (USMA 1933), and his father, Brigadier General Ernest D. Scott, Ret. 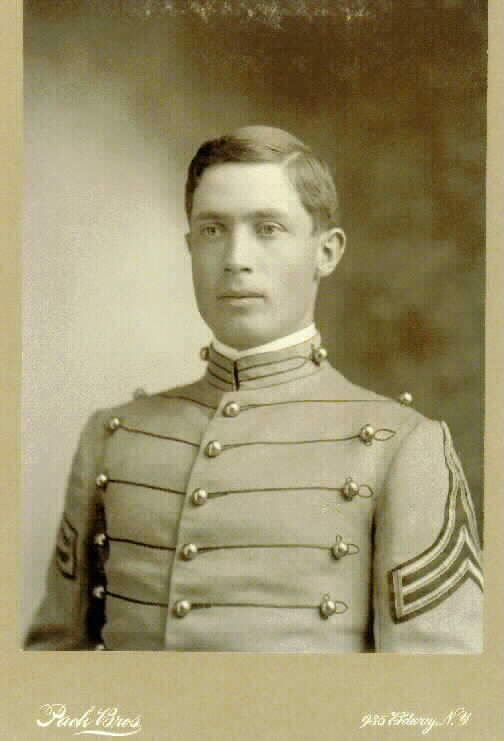 (USMA 1898). As a cadet, his favorite study was history. He won some distinction in debate and was elected President of the Dialectic Society. His interest in the liberal arts was strong, and his oil painting of the Chapel (1931) shows remarkable talent. Holding the belief as an officer that personal experience is essential in all duties, he qualified in aerial gunnery with every gun in his B-17 — some feat for a 6-footer of 180 pounds when one considers the dimensions of the belly turret. On duty, he had the reputation of a disciplinarian. Outside that, he was genial, companionable, and sympathetic with all, regardless of rank. Imagination, initiative, force, and resource were strong in his make-up. War experience and staff duty developed in him a high sense of relative values. His last year gave every promise of a successful future in the Army. Captain Scott trained for his wings at various fields, mostly in the Southwest. In March 1944, he went to England as pilot of a B-17 and soon became one of the “lead pilots” of the squadron. He was awarded the Distinguished Flying Cross with cluster, the Air Medal with four clusters, and was recommended for the Silver Star. Early in 1945, he came to the States on a 30-day leave, and on his return to England was assigned to the Air Division, United States Group, Allied Control Council, with which he served in London, Versailles, Frankfort am Main, and finally Berlin. From there he was sent that fall to the Staff College, Fort Leavenworth, Kansas, as a student officer on temporary duty status from Berlin. After graduation in February 1946, he was assigned duty at Headquarters, Army Air Forces, The Pentagon, Washington, D.C.
A Canadian, Ernest Darius Scott was born on 6 September 1872. His family had moved from Ontario to Nebraska before Scott entered high school, and he received his appointment from the 2d District of Nebraska. He studied at the University of Nebraska before joining his class. As an Artillery officer, the war with Spain took Scott to the Philippine Insurrection, where he earned two Silver Star Citations. He also was awarded the Distinguished Service Medal for his service as the Commanding Officer of Field Artillery regiments and brigades as part of the American Expeditionary Forces in France. Scott commanded the 15th Field Artillery from 1927-28 and the 11th Field Artillery from 1920 -31, when he was promoted to brigadier general. BG Scott retired in 1931 and moved to Miami, FL. He died at Homestead Air Force Base on 12 May 1962 at age 90. BG Scott has two sons who are also graduates of West Point, Bruce Scott, ’33 and Ernest Scott, Jan ’43.